There is a darkness within us all. In a blasted land where magical wonders abound, the people are protected by four heavenly warriors, avatars of the four animal gods of Chinese astrology. The avatar of the South, Sou-sama, has died, choosing an untested, foreign boy, Dark, as his successor. With the winged Spirit Guide Kyo, Dark undertakes a terror-fraught journey to the emperor's palace to formally present himself as the Phantom Saint (Gensei) of Suzaku. On the way, he confronts each of the other three Phantom Saints and begins to understand what will be required of him as ruler and protector of the South Kingdom (Nanban). Leen, the newly-risen ruler of the East Kingdom (Tou), takes her own parallel journey to find the Sphere of Gold, a source of life-giving magic lost generations ago by a previous Phantom Saint of Seiryuu. Immense power is the inheritance of new Phantom Saints, and Dark and Leen must learn to control that power and use it against the true enemies of their people. Dark has an especially difficult time learning control, as his foreign blood mixes with his magic in unpredictable and destructive ways. Published in Newtype by Kadokawa Shoten, the 5-volume Dark Angel manga was terminated early and to date has not been adapted for animation. The self-contained nature of each volume would seem to be ideally suited for an OAV series, but alas, no company has taken up the project. The story is available in other forms however, such as drama and music CDs. There is also a 3-volume compilation of the manga, including associated CD-ROMs with narrative drama tracks and production extras. 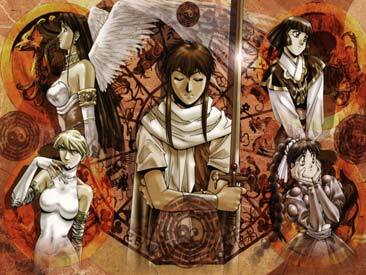 Dark Angel has been translated into English and is commercially available in the U.S. by CPM Manga. Also, a grittier, alternate version of the characters and events can be found in Dark Angel: Phoenix Resurrection. Studio TRON and Todd McFarlane's Image Comics are collaborating on this daring project that has yet to prove its long-term feasibility. If successful, Phoenix Resurrection could be the beginning of future transoceanic production teams made up of Japanese and American comics artists and staff. The best marketing for Dark Angel, besides the story itself, comes from the artwork. The fantasy setting allows for the use of melodramatic or romantic scenery, and the Four Kingdoms plot provides a never-ending host of characters. This series probably pushed the Studio TRON crew to their limit for character and location designs. The results are often breathtaking, but sometimes distract from the plot. Moreover, the computer-graphics team went a little nuts with this one, coming up with fantastic perspective shots and character portraits. Many of these are used as cover art for the individual issues of the English release or as full-color glossy inserts in the original Japanese (oversize) tankoubon. Recently, Fanboy Entertainment has taken up Dark Angel merchandising as a major project, so all manner of figures and posters are coming out that capture a little bit of that ethereal beauty.